English Muffin Pizza made with Homemade Sauce! My kids love being able to help cook. English Muffin Pizza is one of the easiest recipes to have the kids help with. They can customize their English Muffin Pizza any way they want to! 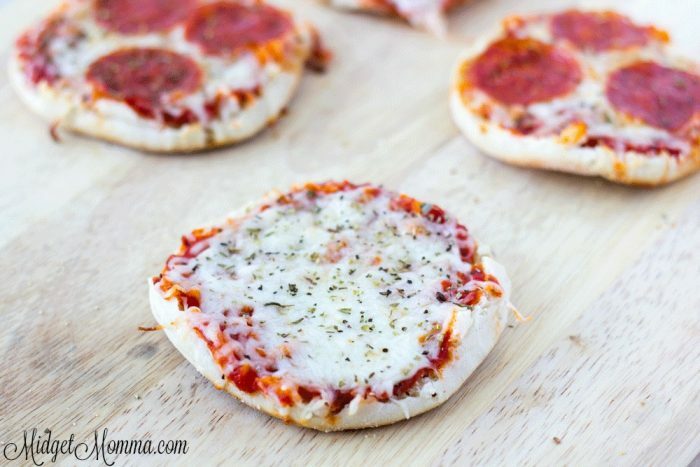 Plus English Muffin Pizzas are so easy to make and the kids think they are fun! I am thankful my kids are not picky eaters at all and they will eat or at least try anything that we make. But helping make the food is a good way to get kids to try new things since they helped make it. When making your English Muffin Pizza you can use my favorite homemade Pizza sauce and any toppings that you would like to. We love adding veggies on top of our english muffin pizzas along with things like ham and pineapple. You can totally customize these. It is also a great meal to have for a kids party and you can make a pizza bar for the kids to make their own. Break apart English muffins and put inside part facing up on a baking sheet. Sprinkle shredded mozzarella cheese on top and add your favorite toppings! Bake at 400 degrees for 15 minutes or so until cheese is melted. Here is a quick and easy lunch idea that the kids can help make too. 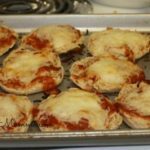 English Muffin Pizza is a favorite in our house and I am sure will become one in yours too!!! This is a perfect easy English Muffin pizza recipe that everyone in your family will love. You can add turkey pepperoni, olives, ham, onions, bell pepper, or any other toppings you prefer, just make sure to count points if you are using Weight Watchers.